MotoGP 2018: Warning, may contain Spoil. 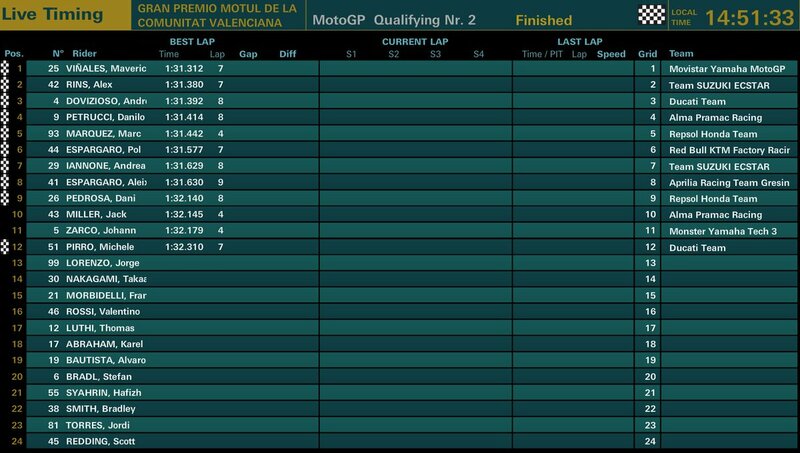 There were at least three riders in Q1 dawdling round who baulked Bradley Smith on the last corner, he was possibly going to get into Q2, but had to slow for the dawdlers. Can't believe they weren't penalised for that. Aye, there's waiting for a tow .... and there's riding at walking speed. Time they had a word about that. Vinales and Morbidelli have been given grid penalties for the incident in Qualifying! A bit processional and yet another race dictated by tyres. If this is the pinnacle of short circuit motorcycle racing why are the tyres holding the bikes and riders back? We've now had two "races" back to back were tyres have dictated both the pace and the eventual out come, previous to that we've had a race shortened by a couple of laps because the tyres wouldn't last the distance. IMO they should ditch the one make "control" tyres and go back to a free for all, whatever tyre the teams want to go with, because at the moment I appear to be watching a high speed tyre testing session and not an actual motorcycle race! Agree with Sid. Might as well make it a 10 lapper and have some real racing or make them longer with a pit stop. Seems as if bike development has outstripped tyre development, one make being used doesnt promote development, but something's got to change before it ends up like boremula 1. Just like Formula 1 was five or so years back just before it properly went down the shitter. It's getting ridiculous. Give them a proper tyre and let them race flat chat for the whole event. 25 and 7 times world champion. The best of the rest are in awe when they read his data, I'm in awe that he hasn't mullered himself and gobsmacked at his consistency to save the front/rear end. Indeed, like him or loathe him - you cannot argue with his skills. Did you hear in the discussion post race about his telemetry data? Apparently they've never seen someone who can survive so many front wheel lockups and not crash. Personally, i like him and his attitude to the media / fans. Even though I, like most of us here have watched him from year dot, still don't feel like I really know him. He's a bit corporate for me to completely take to him. The years when races become tougher will be hugely entertaining and it's pretty good at present. Props to Crutchlow for not falling off and nice 1 Suzuki. 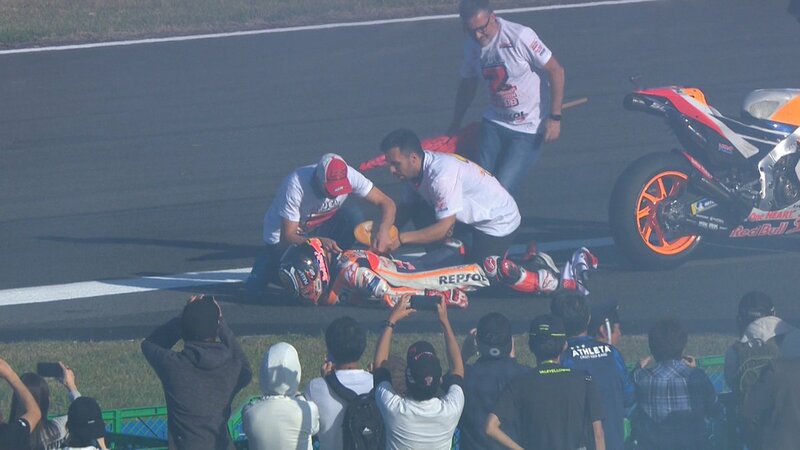 Seems that Marquez dislocated his shoulder during celebrations. They joked at the time that it was part of a celebration stunt... Obviously not. I felt exactly the same, but after watching some (propaganda) videos have changed my mind. Found these very interesting, especially how his team came to be, how ridiculously sharp him and Santi are (barring one minor fault on the tyre change lap count the other year). How the Spanish half of the garage are so massively different to the Japanese, but how they make it work. My view of him changed a lot. Maybe I'm just too impressionable. This was free on BTsport, might be searchable via app. None of this excuses some of his perceived disrespect / ramming riders etc But, meh, there have been far worse and he's 7x champ at 25. PS. Never accept a hug off of Scott Redding. I remain unconvinced...but open to be fickle. Currently struggling and failing to stay awake for Philip Island. Just seen MM save the front during Warm up. 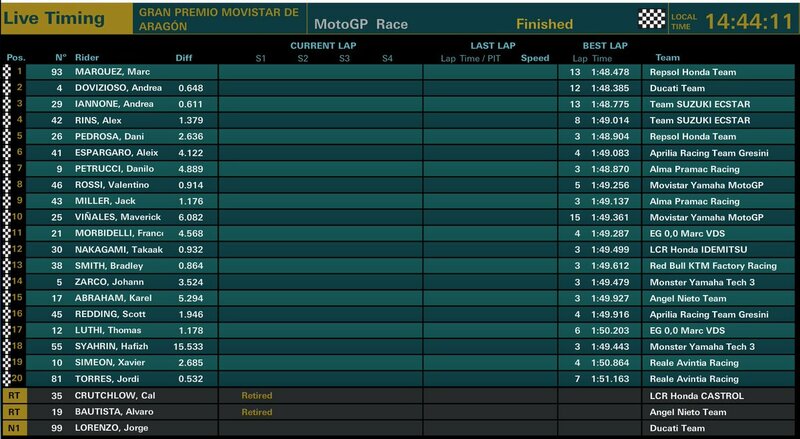 Marquez win at any cost. I don't think he meant to do that. Moto3 was the usual madness, at one point they were 8 a breast going into the first corner! Unfortunately Bezzecchi got nerfed off again, (not his fault), that's twice in 2 races, FFS. There was also a massive crash that both riders waked away from. Moto2 was also worth watching, much fairing bashing! Shame they can't just race the whole season at Assen, Mugello and Phillip Island on alternate weeks! I was impressed Iannone avoiding being hit by it. 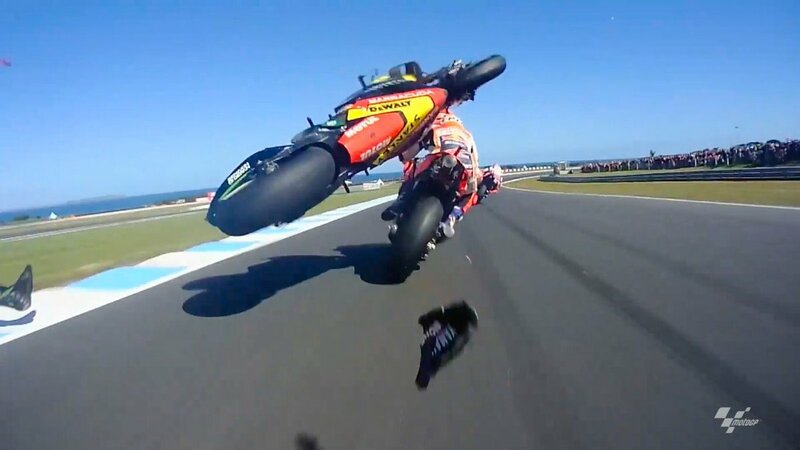 I reckon anybody who's even a tiny bit into competitive sports could be converted to motorcycle racing by Philip Island. It's just so perfect for bikes, never a dull moment. Huge respect for Bautista too, not just for sheer speed, but also having the balls to actually dice it with the chaps at the top and the composure not to bin it. 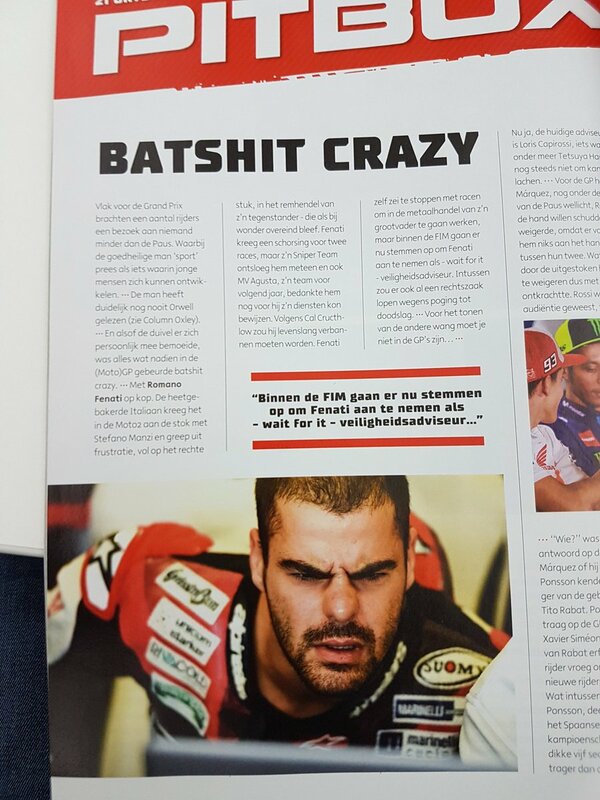 In other news Romano Fenati's ban has been reduced from 8 to 5 months. Imagine how cheap he would be to keep and lest we forget he's won 10 races in moto3...was the runner up last year. He's 22....what else can he do other than race again? Sepang this weekend....'bout time Maverick pulled his finger out...'bout time Rossi girded his loins...and Dovi. Well the season zipped by. Been a good year but not a classic. 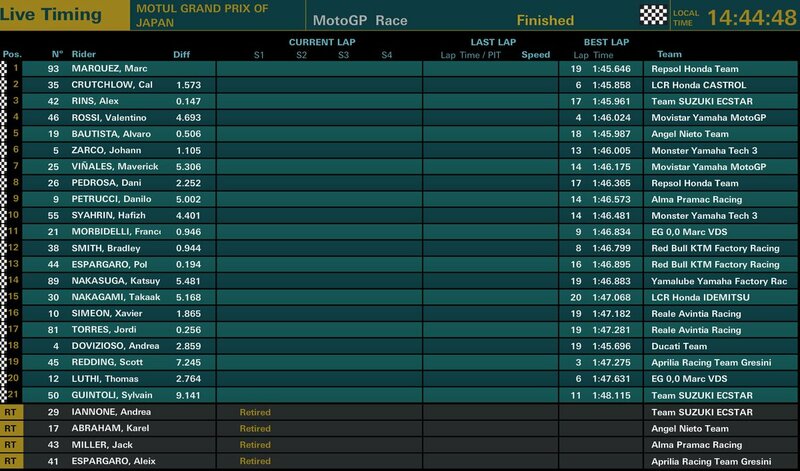 Redding way off the pace. Dislocated his shoulder again and still fast. Phew!